Millwall boss Neil Harris felt his side had picked up an "excellent point" in their quest for a top-six finish after battling back for a 1-1 draw at Sheffield United. Leon Clarke put United ahead with just 16 minutes remaining at Bramall Lane with his 18th of the season, but Millwall were level inside two minutes thanks to Steve Morison. 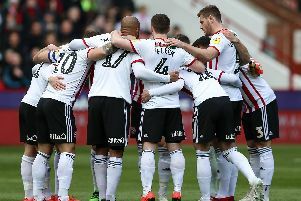 The result means the Lions, who started the day in fifth, remain three points ahead of the Blades in the race for a berth in the Championship play-offs. Harris was pleased to see his decision to rest the former Norwich and Leeds striker in midweek pay dividends. He said: "I just felt with the importance of today against Sheffield United's really disciplined shape and their freedom of play that Steve's leadership would be key and a fresh Steve Morison was key. "I'm pleased I made the decision to rest him during the week because Tom Elliot scored the first goal then and 'Morro' scored today." Lee Evans was unlucky with a curling effort in the first half for United, before their top scorer Clarke nodded in the opener after Jack O'Connell headed the ball back across goal. Morison struck back almost immediately for Millwall, and visiting goalkeeper Jordan Archer ensured the visitors would be returning to London with a point when he produced a sensational save from Billy Sharp's header.